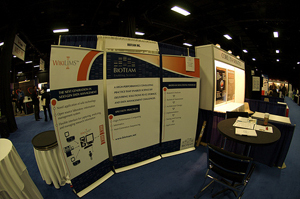 Need Trade Show Graphics and Displays in Phoenix? Marketing to hundreds or even thousands of people in the same enclosed space is the perfect time to get the word out about your company. Not only is it a great way to appeal to a whole new onslaught of potential customers, it offers spectacular exposure for your product. But what if your competition is set up within a few feet of you? Beyond that, what if you are surrounded in literally every direction with folks who offer similar products and services? Yes, I’m talking about trade show days. Stand Up and Get Noticed! Making sure your product or business stands out is always a high priority. However, this goes double when you are confined to an exhibition hall with industry leaders abound. Done right it can mean huge ROI’s for your brand. Without proper planning you could be wasting company time and money. By agreeing to participate in a trade show, you are also committing to allocating precious marketing dollars for travel expenses, entry fees and staffing. While these are the necessary nuts and bolts to get you there, all your planning means nothing without the most pivotal part of any exhibit- trade show graphics for your Maricopa County business. At Spotlight Signs & Imaging we understand that in order to truly stand out, creating mediocre graphics and displays is simply not enough. We are committed to providing quality, show-stopping trade show displays for your Phoenix business, helping you successfully grab the attention of prospective clients. Banner Stands – These traditional banners are an essential way to brand your business by prominently displaying your company name and logo. They can also come in retractable varieties, making them a cinch to put together and take down. Pop-Up Displays – Want to display your product from all sides? Why not consider a pop-up display comprised of tents or prefabricated booths! Whether you’re looking to promote your logo, website or a QR code linking to further information, these are a fantastic way to showcase product graphics from multiple angles. Custom Imprinted Table Covers – Give your expo reps an easy, organized way to store extra products and brochures while simultaneously promoting your brand with custom table covers. Promotional Items – People love free, useful items to take along with them. Be it a nice ink pen, mouse pad, or coffee mug, promotional products can be an effective way to continue solidifying your brand long after the expo doors have closed. Digital Banners – Want to make a one-time investment that will last? Our digital banners are made with heavy-duty vinyl so you can take them with you all over the country and use again and again. Floor Graphics – Most spaces require you to make your impact within a 10 X 10 ft. area. Why not utilize every square foot of space, including the floor! No matter your budget, size restrictions or type of product, we can craft our displays to fit a wide vary of sizes, offer cost-effective solutions and customize graphics to match your current branding. Trade show displays and graphics for Phoenix or Maricopa County businesses are our specialty and we take our products very seriously. Contact Spotlight Signs & Imaging today to find out what we can do for your brand. After all, your sales representatives can’t give a proper sales pitch or hand out brochures without a crowd!